HE PEOPLE WERE at first very sorry for having so displeased God. But they soon forgot it all; and the next time that they were without water in their encampment, they murmured, as usual, against Moses and Aaron. 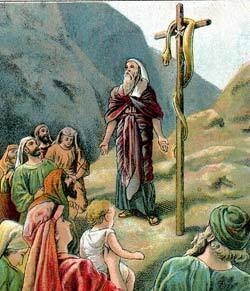 Then God commanded Moses to take the rod with which he had struck the rock in Horeb, and before all the people to speak to a certain rock, which He pointed out, and it should give water for them and their cattle.